Editor’s note: Valley legislators sent the attached letter to the CWC last week, reflecting both disappointment and concern over the CWC WSIP process as it relates to the Temperance Flat Reservoir Project. The letter asks for a reconsideration for the TFR ecosystem evaluation. Clearly, we appreciate all our Valley legislators who have fought so hard for this project for many years. This letter at a minimum puts on the record their thoughts on how the CWC handled the TFR project. On May 3, 2018, The California Water Commission took action, perhaps the most definitive and historic action with regard to the Water Storage Investment Program (WSIP) state bond funding applications. As members of the California Legislature, we have watched and participated in this entire application process. All Californians would benefit from water storage projects this money is intended to fund. However, this investment has been stymied by the commission staff’s narrow determination. The people we represent have expected a great deal of positive leadership from the Water Commission and we echo the public’s disappointment in how the review process has unfolded. During the initial review of WSIP project applications, many of us joined in calling into question the policy and procedures of the application review process. From the beginning, we had concerns that the process developed by commission staff and the information provided would not adequately account the benefits of water storage projects throughout the state. Despite our concerns, little was done to address the problem resulting in six of the project scores receiving “O” benefits. 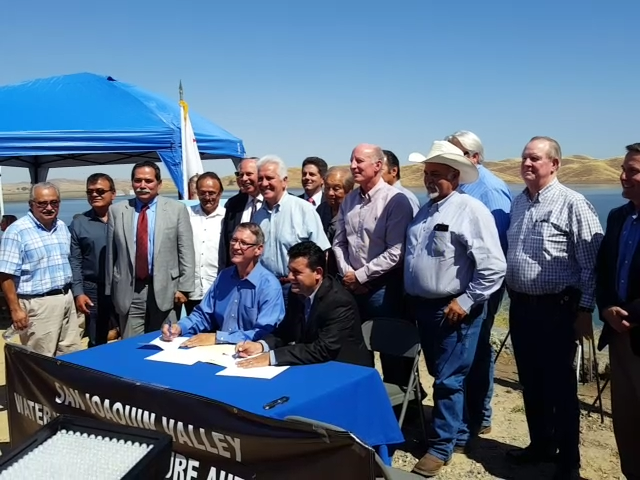 Mario Santoyo is Executive Director of the SJV Water Infrastructure Authority, which presented the Temperance Flat Dam Proposal to the California Water Commission​. In 2008, the EDT model was selected by the state and federal agencies responsible for implementation of the San Joaquin River Restoration Program (SJRRP)—namely the U.S. Bureau of Reclamation, the U.S. Fish and Wildlife Service, the U.S. National Marine Fisheries Service, and the California Department of Fish and Wildlife (CDFW). In the Quantitative Fisheries Model Selection Recommendation Process, 2008, the SJRRP agencies state that EDT was rated ” … as the most appropriate quantitative fish population model for the SJRRP.” This report also states that “the EDT model is a framework that views salmon as the indicator or diagnostic species for the ecosystem. The salmon’s perspective (i.e., its perception of the environment) becomes a filtered view of the system as a whole. In 2014, the U.S. Bureau of Reclamation selected the EDT model for application to the Upper San Joaquin River Basin Storage Investigation—the federal feasibility study of Temperance Flat Reservoir—to quantify benefits. Prior to its application, Reclamation commissioned a scientific peer review of the EDT model to confirm the suitability of its use for quantifying benefits. It is our understanding that when the SJVWIA team asked if there were any models that could be used in place of the EDT, the CWC staff declined to respond. This is of clear concern and demonstrates the inconsistencies within the information provided by commission staff. From the San Joaquin Valley’s perspective, the outcome of this process is a black eye for the state. The two-thirds threshold for Proposition 1 in 2014 would not have been met without the support of the San Joaquin Valley. Despite the bias by some opponents against large-scale storage projects, the language in AB 1471intentionally included Chapter 8 (Provision (a), section 797.1, page 22) to clarify that the Legislature’s intent for the $2.7 billion allocation was for surface water storage projects with an emphasis on Sites and Temperance Flat Reservoir based on the CALFED Bay-Delta Program Record of Decision, dated August 28, 2000 (Section 2. Decision, 2.2 Plan for Action, 2.2.5 Storage, pages 42 through 45). We the members of the Legislature believed that by voting for Prop 1 funding that all projects including controversial storage projects in the CALFED Bay Delta Program would be given a fair and accurate evaluation in order to meet the overall water management strategy for the state. In closing, we insist that the Water Commission reconsider its acceptance of the staff recommendation on the Temperance Flat Project’s ecosystem scoring or at the minimum direct the staff to go back and re-evaluate the application’s ecosystem public benefit utilizing the Ecosystem Diagnosis and Treatment (EDT) model cited in the Water Commission’s Technical Reference Document as being acceptable for use in the analysis required by the application. Please do not believe the author’s staff if they state that this legislation is not targeting the Temperance Flat Reservoir project; it is. Not only would the TFR project be in jeopardy, but other future projects in other tributaries would be as well. Again, they may suggest “approve with amendments.” Just say “NO.” If this door is opened even a fraction, we will not be able to close it when they decide to enhance it. Temperance Flat Reservoir offers a big solution for flood years, said Ron Jacobsma, General Manager of Friant Water Authority, who spoke at a special California State Board of Food and Agriculture meeting in Sacramento recently regarding solutions to California’s water situation as we may be entering a fourth year of drought. “The bottom line: We are not in a position to waste any more flood water. We have groundwater overdrafts all over the Valley, and if we don’t start balancing our water supplies from a regulatory perspective, but also managing when we have these generous years, we are going to end up with tens of thousands of prime agricultural land taken out of production,” said Jacobsma. Jacobsma was focused on the proposed Temperance Flat Dam that would provide an additional 1.25 million acre feet of storage behind Millerton Lake and Friant Dam which holds only 400,000 acre feet. “We have spilled over Friant Dam more than one million acre feet of water over the years, which ends up going to the ocean, and Temperance Flat would stop this,” said Jacobsma. “What Temperance Flat will do is enable California to use the water twice. How do you use it in a non-consumptive way for the environment? We can create cold water pools and augment flows on the San Joaquin River. But then we can pick the water back up and move it to where it needs to go, either as irrigation supplies that year, or to recharge groundwater basins. And we have to get in the other side of the aisle–if you will–and start thinking about this,” noted Jacobsma. “It is going to take some time to build those coalitions. First you have to build local support, then regional support, then broader state-wide support. That is the kind of effort that we are going to have to go through,” Jacobsma noted. “The other consideration with regard to Temperance Flat is how we would protect the water it stores. If we get into an operational plan, how do we protect ourselves? If our water users spend more than a billion dollars on surface storage, just to have some regulation or law passed demanding half of the yield, but we’re stuck with that price tag, that’s a huge risk for our guys,” noted Jacobsma.